Blog Posts Buy A Van What Is The Best Van To Live In? What Is The Best Van To Live In? So, you want to build a camper van but don’t know where to start. It shouldn’t come as a shock that there’s more than one way to address this question. 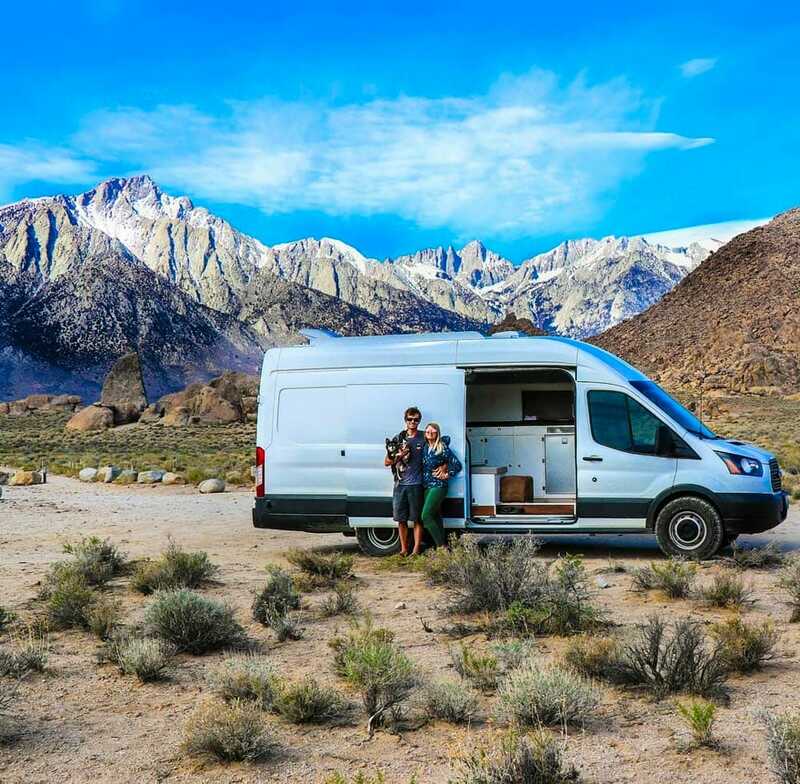 Ultimately, the best van to live in is based on your budget, mechanical skills, and what type of van life you want to pursue. American cargo vans make great bang for your buck vehicles. These vans are based off of pickup trucks so they generally have big motors and heavy drivetrains. They can tow a decent amount and have a lot of aftermarket support. Cargo Vans generally come as a blank slate which is perfect for building. You can get a reliable used van for $5,000 or less in this category. Often delivery services or plumbing companies (or any myriad of business) use them as fleet vehicles. If you find the right seller they often have scheduled service records – although some are driven quite hard. Parts are cheap and easy to come by in the US because these vehicles share many systems with all of the pickups out there. This is a huge advantage if you get stuck or your van breaks down. Any mechanic shop nearby should have parts on hand, or on order within a day or two. Mechanics know how to work on them and they have been doing this for years. Even in the worst case scenario, breakdown expenses are still relatively palatable. With a cargo van, you can get a transmission replaced for under $2,000 including labor: try that in a Sprinter! Conversion vans are simply factory upgraded cargo vans. They share the same chassis but with windows and seats that fold into a bed. Many times they will have rear climate control and other adventure amenities as well as storage. Conversion vans were built for weekend trips but generally not designed for full term living. Typically, there are fewer conversion vans on the market compared to cargo vans and they tend to be more expensive. However, if you find a good one they’re a great base for a van dwelling vehicle. Cargo vans and conversion vans both come in high-top versions with varying levels of headroom. You may want to read our post answering the question do I need to stand in my van? Both cargo and conversion vans usually have curved walls. This makes insulation and construction a little more challenging than in a square vehicle. If you’re looking for cargo or conversion vans for sale, read our post on how to buy a used campervan. Sprinters, Promasters and Transits are also technically considered cargo vans, although may people refer to them as Euro-style cargo vans. They are a dedicated design that is not built off a truck base and their cab is pushed forward over the wheels to create more space. This is a newer style of vehicle and often used as a premium delivery vehicle. They tend to be more expensive. This style of van is often what you see on Instagram with large showers, bathrooms, workspaces and tons of storage. The benefit to owning one of these is lots of space to store more and carry more. Euro style vans get good gas mileage as well as they are generally newer and have smaller motors. Euro style vans look great, but they also come with a high price tag. It will be difficult to find a reliable, rust free option for under $15,000. Converting a Euro style van requires a high budget because parts are more difficult to find and they can often only be serviced at specific dealerships. The quality and reliability of these varies quite a bit so we will stick to some generalizations: Older sprinters tend to last longer than the newer ones because of the new emissions regulations. Transits have the most expansive US dealer network and so it’s not as hard to get them serviced. Ram Promasters are front wheel drive and so therefore have the biggest cargo area with a large weight capacity. A local mom-and-pop mechanic shop is likely not going to have the required tools to service a Mercedes Sprinter or Ram Promaster. If something goes wrong like a timing chain breaks, it’s going to cost big dollar to replace. That said, because these vehicles are newer, they break down less frequently. They are designed to drive many miles hauling cargo. If they are taken care of and get the required maintenance, they should last a long time. If you’re looking for a weekend getaway, romantic vehicle or picturesque images the VW Vanagon is for you. Vanagons have a high up-front cost but they are easy to repair. That’s going to come in handy because these things are old and break down a lot. VW buses have relatively easy-to find parts and if you’re mechanically inclined they’re quite DIY oriented. The community behind the old VW’s is huge. There is a lot of online support and cool modifications to inspire your build. They are simple to learn car repair on on and will make you feel like you’re living the dream of a lost era. Older American vans are a bit harder to find parts for but still quite easy to work on. Some of the 1970’s Dodges and Fords are downright beautiful, and there are many camper conversions that are well laid out like the VW Westfalias are known for. So what are the downsides? VW buses are great to show off but you’ll have little chance of being stealth in this vehicle. The motor is usually underwhelming so don’t expect to be cruising up the steep mountain roads or getting good gas mileage. An 1990 vanagon fully loaded is going to get you 15mpg which isn’t too bad until you consider that it’s only pushing out 90hp. All of these old cab-over-wheel vehicles are quite unsafe. Most of them don’t have any airbags to speak of and their crumple zone is your ribcage. Everything in life is a risk, so that won’t be a deterrent to everyone, but it’s good to be aware of. If you’re trying to get out in a hurry or don’t have many resources to buy a van, the cheapest vehicle is one you already own! There are many people who have spent a considerable amount of time living out of their Civic or thrown a topper on their truck. There’s always a risk with buying a used vehicle, so cut that risk out by using what you have. At least with your current vehicle you kind of have an idea of the mechanical issues and how well it drives. We recommend the website cheaprvliving.com for specific tips and tricks on how to live a low-budget lifestyle in any vehicle. You can also check out the subreddit r/priusdwellers. Converting a retired school bus is a great way to pack a huge amount of storage or an entire family into a vehicle. This type of conversion can be larger than many RV’s. We recommend checking out the subreddit r/skoolies for information on how to get started. Lifted Tacoma’s, Safari-style Land Rovers, Sportsmobile Vans, and the like are all more dedicated to long boondocking trips in foreign countries and forest roads. These have a much pricier drivetrain for the amount of living quarters that you get and keeping up on maintenance is more important because you can’t have them break down somewhere in Alaska, 70 miles from cell phone service. Overlanding vehicles are fun and have a great community of followers. If this lifestyle is appeal to you but you’re new to it, it’s important to join groups that you can travel with to learn the ropes. Remember, the further out your vehicle can go, the further you have to walk back if you get stuck. Class B RV’s are extensively converted aftermarket cargo vans with a higher price point. They often come with water tanks and shore power capabilities as well as a full kitchen setup. 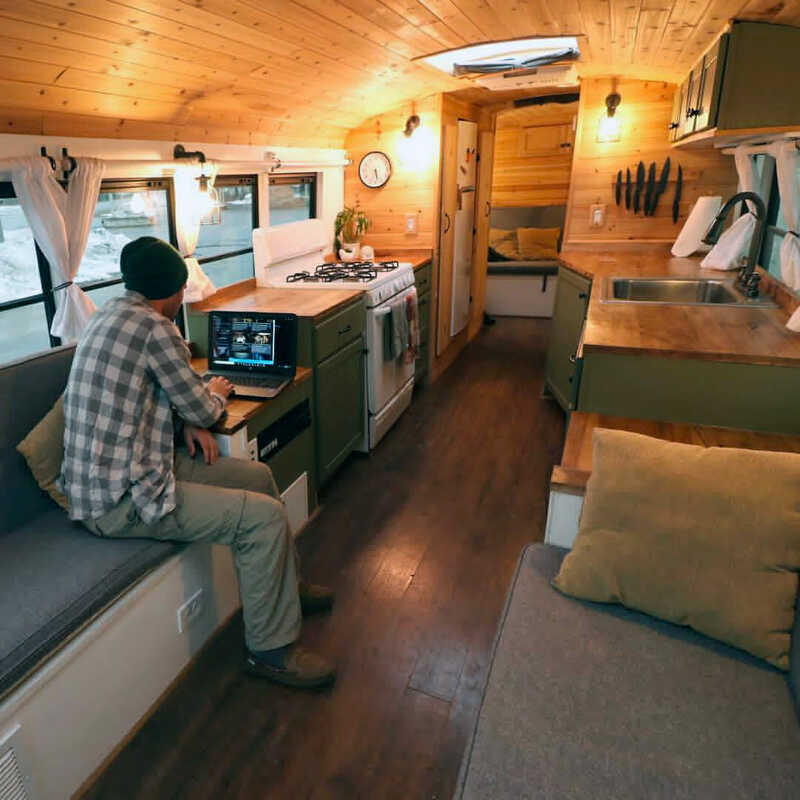 Most RV’s are built to be light and to make a dollar, so the interior quality is often sub-par for long term dwelling but they have clever storage and efficient layouts. Because they are professionally converted, the will be registered and insured as an RV. Do You Need A Van You Can Stand Up In? I would add in box truck versions of either traditional US vans or the newer Euro vans. The chassis and cab is the same but the large box on the back has the advantage of more room AND everything is square. It is way easier to work convert the flat walls and ceiling of a box truck then trace every curve and contour of a cargo van. Intrigued to see that conventional mini-vans were not included in your list. Quite a few people writing now about using their Dodge Caravan or equivalent minivan for part-time (or longer) living. Advantages include better fuel economy, plentiful supply of used vehicles, lots of window glass (although cargo versions of the Caravan are available also, used), ease of conversion, plentiful parts availability (depending on the model and year), and multipurpose use (can be main vehicle). Downsides include smaller space, less privacy, low roof height, lack of insulation.